TBUZZ – An Arc90 Project from Arc90 on Vimeo. We’re big fans of Twitter here at Arc90. We use it to share choice quotes or just talk about whatever. Hell, there are even people out there wiring Twitter up to their ovens. Of course, one of the most popular uses of Twitter is to share a link to a Web page. 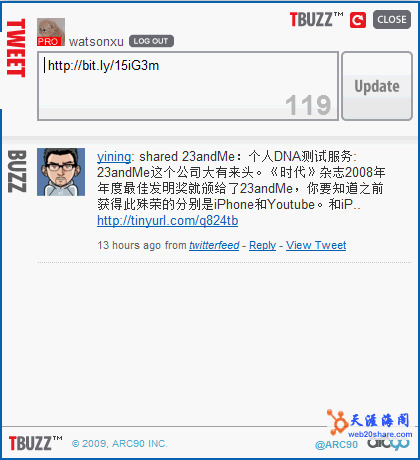 To that end, we wanted a tool that provided a dead simple way to share a link out via Twitter while surfing the Web. So we got to thinking: “Wouldn’t it be cool to tweet a page in just a few clicks? Also, wouldn’t it be cool to see what others are saying about the page on Twitter?” After the success of Readability, we figured we’d dust off our mad bookmarklet skillz (Firefox extensions are nice, but we wanted everybody to join the fun) and take a crack at coming up with something cool. TBUZZ | An Arc90 Project.